I think it’s just about official. Spring has come to the East Coast! The snow has melted, the birds are singing, and my son’s allergies are going haywire. And, those first flowers of spring, the crocus, are popping up all over the place. So that’s what I’m making today – a quilling paper crocus! I’m excited to be sharing this tutorial because it showcases a technique that I’ve been waiting to show until the perfect moment. I was looking for these crocus to be as dainty as they are coming right out of the ground, so I’m using thin 1/16” white quilling paper strips for the petals. 1/8″ strips will work, too, but will make a larger flower. Look back at the succulents I created with those for an idea of what that would end up like. Glue two 17″ strips end to end to make a long strip. Roll the long strip around the quilling tool of your choice. Without gluing the end of the strip, remove the coil from your quilling tool. Hold the coil carefully and let it unravel a tiny bit from the middle. This might take some practice, but you can always reroll your coil if you want to. That open space in the center of your coil allows it to be squeezed into an oval shape. Bear in mind that the super-thin paper doesn’t have much width at all, so make sure you’re holding the front and back with one hand loosely while guiding the opening with the other. Otherwise, the middle might just pop out. I also don’t have much faith for the circle guides with this size paper. The coils would be too hard to remove because they are so thin. When your oval is the shape of a flower petal, glue the end of the paper strip to keep it in place. You’ll need 6 petals for each flower. While pinching, add some glue only on the bottom of the petal to keep it together. It’s really important that the glue is only applied to the bottom third of each petal because the rest needs to be clear for something I’ve been waiting to show for a while – adding watercolors to quilling! I’m even using my kids’ cheapo watercolor paints, they’ll work perfectly for this one. Watercolor paint doesn’t have to be intimidating; its just a matter of knowing a little technique. First, brush a little plain water on the outside edge and around the top of the petal. In order to have that flowing, blended look to your paint, its best to brush it on a wet surface. Next, add the purple watercolor paint. You’ll want to start with just a bit. You can always build it up with more paint after. As you can see below, my first pass with the paint was really faint! The glue on the bottom of the petals acts as a resist, so no paint will stick to that part of the paper. After painting both sides of the petal, put aside to dry. When the paint has dried, it’s time to start building your quilling paper crocus! First, stick 3 petals together on a piece of wax paper. Let sit for a few moments, then place in some sort of mold so the petals dry in a cup shape. I like to use the underside of my dome mold. Push gently on the center so the petals point up and dry fully. Once those first petals have set, add the other 3 on the outside so it looks like the crocus is opening. While the flower is drying, start making the orange stamen for the center. I used short strips of 1/16″ melon paper to match the size of the rest of the crocus. Roll each strip a couple turns on your quilling tool, glue the coil to the rest of the strip, and pinch to flatten. Each flower has 6 stamen of different heights. Glue the stamen to the center of the crocus so they stand up straight. You can stop right there and have amazing crocus for frames and cards, or you can go all out and make some stems, too. I used wire, floral tape, and quilling paper to create small stems. If you’re interested in making these too, follow the steps as I laid them out in the coneflower project. I can just see this little quilled crocus poking out of the melting snow signaling that warm weather is on the way! 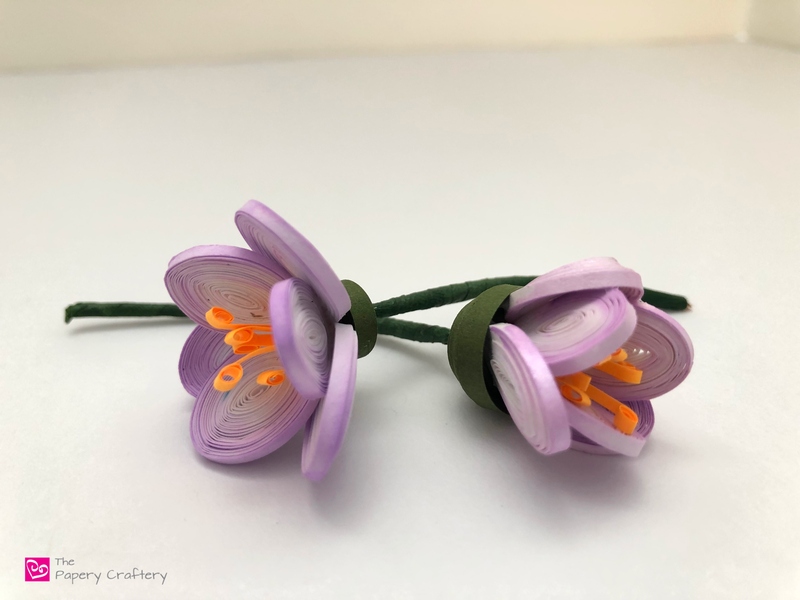 I hope this quilling paper crocus tutorial inspires you to add some watercolors to other projects, too! It’s a really quick way to add colorful details, without having to juggle multiple paper strips. I love the subtle color from the water paint. They´re lovely! Thank you so much for sharing!